It’s safe to say that everyone reading this has experienced some kind of inclement weather in their life. Whether it’s the loss of a job or a family illness, the wind seems to rear its ugly head at the most inopportune times. Alright, enough about the wind. As Mr. Rohn clearly illustrates, we don’t have to be victims to our circumstances. 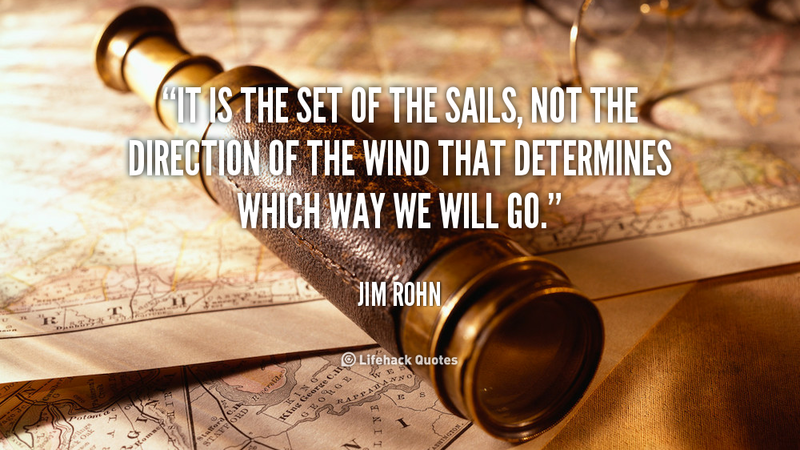 Rather than giving our power to the wind, we can learn to set our sails in any kind of weather. So, what does he mean when he refers to the set of our sails? Some would say that he’s talking about our behavior. In other words, if we want to learn to set our sails in any given set of circumstances, we need to practice new behaviors. For example, instead of complaining about a job loss, we should pound the pavement and start looking for a new job. It only makes sense that if we change our behavior, we’ll begin to see positive results, right? Unfortunately, one of the fundamental flaws of any behavior modification is to overlook the fuel that drives each of our behaviors; our thoughts. You see, every choice we make is rooted in the way we think. In other words, our thinking precedes our doing. Having said this, it makes perfect sense that in order to set our sails we must first focus on the sailor, or the one who’s doing the thinking. Unfortunately, when the wind is blowing in our lives, it’s easy to fall into a pattern of what psychologists refer to as cognitive distortion. This essentially means that our thoughts interpret reality in an inaccurate way. Below are two fairly common examples of cognitive distortions, followed by a more effective way of thinking. Have you ever taken a relatively minor negative event (i.e. someone didn’t respond to your text) and imagined all sorts of disasters resulting from the event (i.e. they don’t care about me anymore)? This is the essence of catastrophizing. Some refer to it as worst case scenario thinking. I’ve heard it said before that an active imagination is both a blessing and a curse. The blessing can lead to all sorts of innovative ways of thinking, whereas the curse can lead to worst case scenario thinking. Have you ever felt a sense of anxiety and immediately made a connection in your mind that if you’re feeling anxiety, something must be wrong. After all, your feelings don’t lie right? Wrong. As a rule of thumb, it pays to be rather skeptical with regard to the validity of your feelings. Your feelings can often be misleading. Fear is a perfect example. Think of how many times you’ve feared something, only to realize that your fear was completely irrational. If we used emotional reasoning with our fears, it would be rather easy to sit on the couch and do absolutely nothing. Mr. Rohn reminds us that it’s our thoughts, not our circumstances, which determine our direction in life. I invite you to put on your sailor cap and practice navigating the seas in a new, more empowering way.